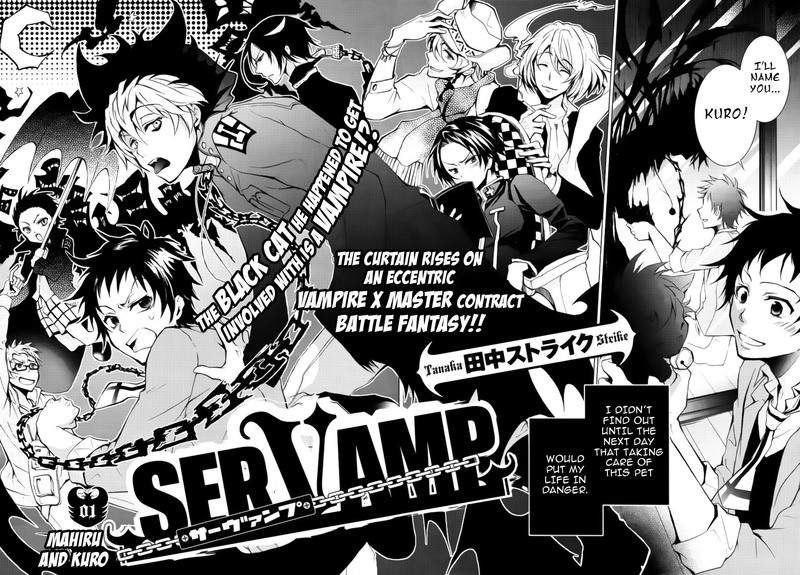 This is a trial of the series “Servamp” from Comic Gene. I’m feeling very ambivalent about bringing yet another vampire series into English, so I’m very eager to read your opinions about the first chapter of this series. As for my personal feelings about this series, I could take it or leave it and, therefore, I want to try out some of the other Comic Gene series before committing to this one. I’m also very open to not doing this series so another group who’s more enthusiastic about it can do it. Anyhow, for now, I will translate the second chapter to see what happens next, but I will not be committing any resources for a release until I’m sure I want to do this series. In the meantime, we’ll give “Antimagia” a whirl and then take a vote ;p.
If you don’t want to leave a comment, but want to give me some quick input about the series, please take this poll (click here). Posted on August 29, 2011, in Releases, Servamp. Bookmark the permalink. 18 Comments. Looks great! Thanks for posting! I hope you decide to continue this series! The more I read through it the more attractive it seemed. Will you be continuing this series? Because I noticed it wasn’t in the 2012 list on the main site. The first chapter didn’t grab me. Considering the amount of work that would have to go into redrawing for the series, it’s not a priority for us. However, I am keeping an eye on the series. If I see a compelling reason to continue the series, then we will continue it. As of now, though, it looks like one of those endless Shounen fight series. Good news! We have a partner to help us with “Servamp” so we can resume the series in February.